• Here’s hoping you survived this morning’s thunderstorms! There’s still a 30 percent chance of showers and thunderstorms on the East End this afternoon, mainly after 3 p.m., but otherwise it is expected to be partly sunny, with a high near 82 degrees and a southwest wind 8 to 11 miles per hour. There’s a 20 percent chance of showers and thunderstorms before 1 a.m. overnight, but otherwise it will be partly cloudy, with a low around 59. Wednesday will be mostly sunny, with a high near 83, and there’s a 60 percent chance of showers and thunderstorms Thursday, when the high will be near 75. • Greenport Village will hold a vigil at Mitchell Park on Thursday, June 23 at 6 p.m. in memory of those who lost their lives in the shooting in Orlando last weekend. More information is online here. • The Riverhead Cardboard Boat Race, originally scheduled for this coming Sunday, June 26, has been cancelled until further notice. The town is working on a new date for the race due to ongoing concerns about a possible fish kill in the river, which is experiencing an algae bloom, high numbers of menhaden fish in the water, and continuing low dissolved oxygen levels. 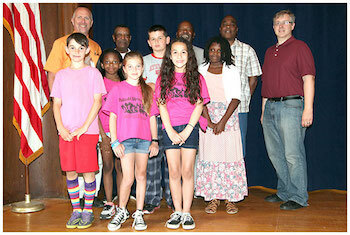 Winners of Pulaski Street School’s 2016 Juneteenth Essay Contest. • The following winners of the Pulaski Street School Juneteenth Writing Contest, about our nation’s celebration of freedom from slavery, were honored over the weekend: Patrick Guice, Abigail Payne and Jayra Barreto. Essays by Auset Exum Simon Solarz, and Shania Morris received honorable mentions. As part of the Juneteenth Essay Contest, fifth graders are invited to write a diary entry, in first person, remembering our nation’s struggle with slavery. They were to imagine themselves as a young slave and write about their thoughts upon first hearing that all slaves were freed. • Members of North Fork Audubon are asking supporters of a carry-out plastic bag ban to show up for this afternoon’s Suffolk County Legislature meeting, to be held at the Riverhead Legislative Auditorium, to speak in public session beginning at 4 p.m. While the proposed ban is not on the agenda, there’s word afoot that the ban may be revised to instead be a 5 cent fee on carry-out plastic bags. • The East Hampton Town Board will discuss a proposed beach condemnation, Middle Highway road improvements and the public portal for the East Hampton Airport at their 10 a.m. work session at town hall this morning. Their full agenda is online here. MTK Hbr: 10:40 a.m., 10:45 p.m.
Orient: 11:41 a.m., 11:46 p.m.
S. JPT: 1:03 a.m., 1:38 p.m.
Shinn. In. : 8:34 a.m., 8:44 p.m.
MTK Hbr: 11:23 a.m., 11:26 p.m.
GPT: 12:14 a.m., 12:52 p.m. Sag Hbr: 12:09 a.m., 12:47 p.m.
S. JPT: 1:43 a.m., 2:21 p.m.
Shinn. In. : 9:15 a.m., 9:24 p.m.